i get by with a little help from my friends…and links that finally work! I’ve started this blog post about half a dozen times. Every time I get going with it, I go back and erase it because it doesn’t do the subject justice. It’s trite and isn’t saying what I want it to. I’ve gotten self conscious about it and just scrapped the whole thing. Here I am again trying to put "pen to paper"…and this time, I’m just going to let the words come out how they want to. As some of you know, I lost my mom about a year and a half ago. To say that I’ve had a difficult time with it would be an understatement. It’s only been recently that I have admitted to myself that some days…the grief I feel is too much to bear…and have started seeking grief counseling. We women think we can do it all – something I know many of us feel. At the end of the day, however…it really is okay to say that you need help, especially when it comes to sorrow, grief and matter of the heart. In going through all of this – and all of the memories that continue to live on – people speak so often of my mom’s cooking. She was quite gifted at it, despite a lack of formal training. She was so good at just winging it – something I wish I had more courage at (both in the kitchen and in real life). She often made up recipes and dishes on the fly. Most of those dishes made their way through one of the kitchens of the restaurants I grew up in. My parents were in the business in one way or another for about 30 years…so that tells you how much winging it she did in addition to raising a daughter, caring for her husband, and trying to live day to day. I look back on it with wonder. I really do. When I ran across the blog event that Chris at MeleCotte is hosting, I really wanted to take part. It’s called Apples and Thyme, and its a tribute to mothers and grandmothers created by Vanielje Kitchen and The Passionate Palate. It’s been a while since I spoke about my mom – the soup challenge was really the last time. I have tried to honor her presence in my life and my career in any way I can, so this event gave me the perfect opportunity to do so. I went hunting for a photo of my mom in the kitchen…and tears have welled up so many times at the realization that I don’t have one. Most of my fondest times I shared with my mom was over food or cooking – and I don’t have one damn photo of it. In an effort to remedy that, I am taking part in the event and making a recipe that was a favorite in my house growing up – a total comfort food dish. Since there was so much winging it, there aren’t a lot of hard copies of recipes from her dishes, either. So…I’m winging it…and trying to create this pasta dish. I can only say that it’s sort of a Midwest simple version of Sausage and Orecchiette. She used sliced Italian Sausage and frozen broccoli with shell shaped pasta. 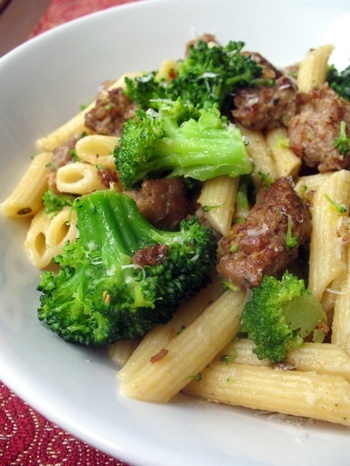 My version has crumbled Italian sausage, quickly blanched fresh broccoli, and penne. It’s a great dish and a wonderful and easy way to document my mom in the kitchen, even if it’s only in spirit. – Fill large pasta pot with water and heat until water is at rolling boil. Add pasta to water and cook according to product directions. About 3 minutes before pasta is done, add the broccoli florets. They will blanche quickly in the pasta water. When pasta is cooked, drain and set aside. – While pasta is cooking, crumble sausage in a large skillet into large chunks and begin to brown. Don’t break the pieces up too small or they will disintegrate. Let them brown and caramelize in the pan. When thoroughly browned and cooked through, DO NOT DRAIN THE FAT. This is your sauce. – Pour cooked and drained pasta & broccoli back into the pasta pot and add the sausage, including the oil and such at the bottom of the skillet. Drizzle the mixture with the teaspoon of extra virgin olive oil and mix thoroughly. If the pasta is too dry for your liking, add olive oil as desired. Sprinkle red chili flakes on pasta. Zest lemon over pasta and add salt and pepper to taste then mix all the ingredients together one last time. Grate Parmesan over the pasta before serving. Serve immediately. Wow, I applaud you for being so brave as to finish this post and in getting help for your grief. Good for you, there are no rules where heartbreak is concerned. Just be kind to yourself and continue to be connected to your mom through your passion for cooking. It will always keep her near to your heart. Take care. This is not at all trite and obviously comes straight from the heart. It sounds like your heart, like mine, and Jeni’s and so many other women’s is full to bursting, which is why we created this event. There is so much that goes unsaid between mothers and daughters, so much that is unnecessary to vocalise, it is understood, yet somehow it feels good to get some of it out into the world. The simplest memories are often the most intense and maybe all of your mom’s winging it was just her way of teaching you to let go and fly. So go on, just fly girl. And cry too if you need to. Moms don’t mind. I’m so sorry for your loss, hon. I hope getting in the kitchen can help channel some of that grief-related energy you might have. Plus, it might bring back some wonderful memories you had of your mother. Tami, this is such a touching post and a wonderful tribute to your mom. It has always been evident how strong you are with your posts, and now, after finishing this post, courage and fotitude is undeniable. Thanks for participating, my friend! Hey Tami. Its been 8 years since I lost my mother and I still cant bring myself to write a post about her Apples and Thyme. But maybe one day… I know if she was around shed love this whole food blog thing and I feel her sprit in me when I cook , because thats what she loved. You know I’d gladly sit at your Mom’s table and at yours. Food from the heart is what this dish and many of your dishes are about Tami. Letting us all experience the challenges, and the outcome (through pictures) is a gift you give us all. Thanks again. Oh, I can really relate to you! We both are still grieving over our mom’s and have so many fond kitchen memories of them. Thank you so much for sharing and I hope you can continue to heal. I love this pasta and make it frequently – it is comfort food! this is a really beautiful post – good on you for finishing it. i lost my mom almost 8 years. she was a kitchen wizard. even though i rebelled away from her and her cooking at the time, i feel a really profound connection now whenever i’m in the kitchen. I am so glad you were able to finish this post. I know how hard it is to put into words a life experience that is just too huge for any of them to ever convey. Have no doubt that you did it. There is nothing trite about it and when I read your post I could feel an inkling of what you wanted to express. I’m so impressed and proud of you that you are taking that step back and realizing that you don’t have to do it all and that that is ok. Thank you so much for sharing the beautiful tribute to your mom. I hope that someday my kids will have those kinds of fond memories of me. I came across this post doing a search for sausage on tastespotting. Just looking for ideas for dinner, ya know? Well your post was very inspiring, and the dish itself was also inspiring. I applaud your strength. The pasta was absolutely fantastic! Looking for a quick 30 min, meal that I can make in the office kitchen without a lot of ingrediants.